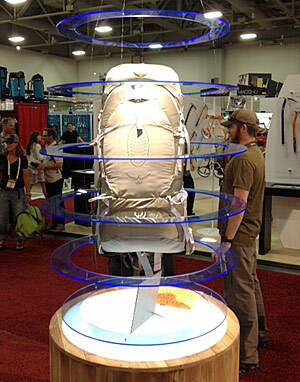 The Outdoor Retailer Show was fantastic. We were able to reconnect with some of our favorite companies today such as Cushe, Carhartt, Travel Chair, Camelbak, Hi-Tec, & Big Sky International. John bravely ventured into an area we are unfamiliar with. Today he discovered what is called glamour camping or Glamping for short. Here are a few images we captured today. A glorious morning where even the Hi-Tec ever growing monster was happy. Bogs showed us their new style of women's fruit rain boots. Did you know they experimented with a scratch & sniff version? It did not make the cut. A nice cup of coffee from Camelbak in the afternoon to keep us going. Even nicer they served it in their new Forge Travel Mug. Just a click of a finger to open the top and just let go to close it. Cushe showed us some extremely comfortable shoes that can convert to a slip-on when the heel folds inward. Our social media guy already knew that as he had a pair on. By the end of the day we felt it best to do some "product testing" at Travel Chair. John found the Big Bubba & was quite satisfied. Day 3 of the Outdoor Retailer Show gave us some great insight in to what is new from some of the industries great brands. We saw Anti-Gravity from Osprey, sneakers from Birkenstocks, unbelievably light clothes from Exofficio, a great place to nap from Eureka and Essential Responsibilities from Patagonia. You can follow us live from Facebook, Twitter and Instagram as the fun happens. We hope you can join us during the day or catch a recap of the day tomorrow morning right here at Fiftysense.com. An old favorite from the '60s Birkestock is doing better work every year. 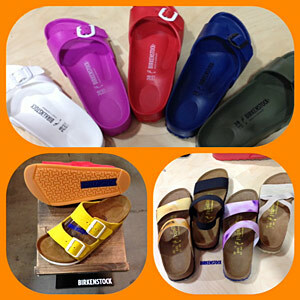 They have incorporated sneaker soles in their sandals, brought an original design in the Madrid back in an EVA sandal, and added elastic straps to many a classics. We hear they are even bringing out suede shoes soon. 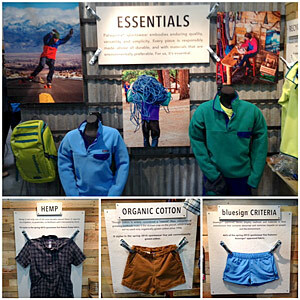 Patagonia's "Responsible Essentials" initiative takes a hard look at using recycled material, organic cotton, blue sign certified, or fair trade certified in their product. Once again Patagonia is leading by example. Exofficio is an industry leader in the adventure travel category. We saw pieces that come in both men's and women's such as the Minimo which weighs only 5 ounces, provides sun protection and looks great. Exofficio has full lines with sun protection upwards of 50 upf and bugs away. We were impressed by the Sol Cool Ultimate Hoody for those who like comfort and style. Osprey's Atmos Aura 65AG is light and comfortable. We really enjoyed their travel line which included a mammoth 110L travel pack. Too big for airports but perfect for our car trips to the AT. Eureka! 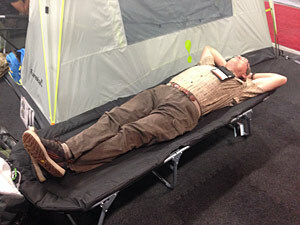 had their Lounger Cot put to the test by our best product tester John. He liked lying down as much as he did while reclining upright. Day 4 showed us just about a little bit of everything. We got outdoors with Marmot's lines of tents, backpacks and travel gear. Mountain Khakis showed us how to dress for the weather. We were especially impressed with the introduction of elasticity in their Camber 105 & 107 pants. For the techy people out there Timex introduced us to their Smartwatch and Fitness bands. One of the nicest surprises was Smartwool going all in on a lifestyle line. 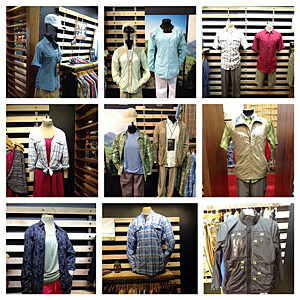 They showed us the ability to really provide some nice pieces in our adventure travel market. 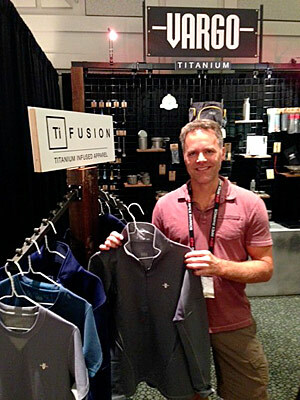 Finally, one of the most original ideas we have seen came via Vargo Titanium in their Titanium infused apparel. 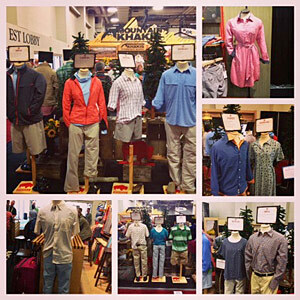 Our morning began with Mountain Khakis as they showed off their very best and held true to their slogan “Built for the Mountain Life”. They have lots to offer to both men and women alike. 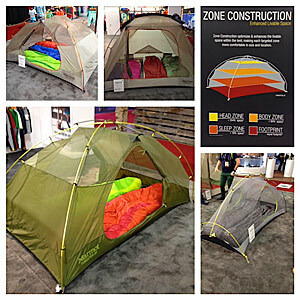 Marmot showed some great advances in design of their tents. They increased the habitable zone by looking at their zone construction. That just means that they found more space just by looking at their tents from a different angle. 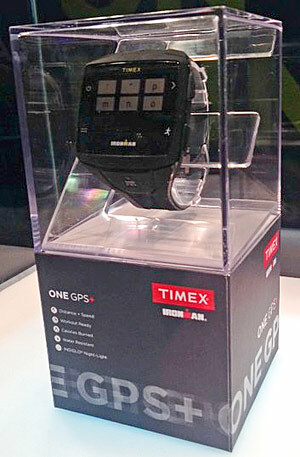 The future is now and Timex showed us what they are doing to be a part of it. Their Smartwatch can store 1,000 songs, tracks your progress in multiple activities, has a SOS mode, and even can send text messages thanks to a partnership with AT&T. 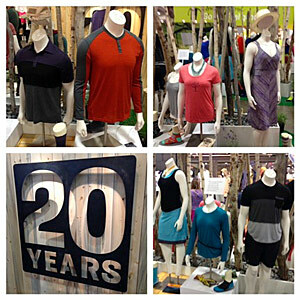 After lunch we stopped in to see how Smartwool is celebrating their 20th anniversary. They really committed to a lifestyle lineup of clothes. They range from cute dresses for the ladies to a Henley for the fellas. Our last stop of the day was with Brian Vargo of Vargo Titanium. He is introducing Titanium Infused Apparel, “Vargo TiFusion.” He is infusing “titanium into outdoor apparel to create clothing with unprecedented qualities. Using light as a catalyst Vargo TiFusion apparel is self-cleaning and quick drying while reducing odors and increasing UV protection.” Very excited to see how this performs. Who knows this could be the next big thing. 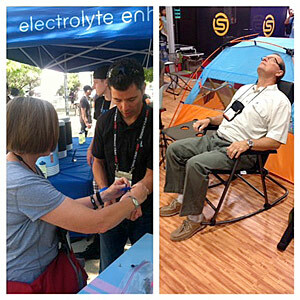 Meanwhile, John was perfecting his craft of product testing and working toward his goal of testing every chair at Outdoor Retailer. At the very same moment Sue was giving a handmade survival bracelet to the CEO (Chief Eternal Optimist) of nuun, Kevin Rutherford. Day 5 at the Outdoor Retailer Show is in the books, which means as you read this we are most likely on an airplane home. The last day of the show is a bit shorter because we are all ready to get home and relax. Having this much fun is exhausting after 5 days in the world’s greatest grown-up toy store. Today we made our way to Sherpa who originates from Nepal. 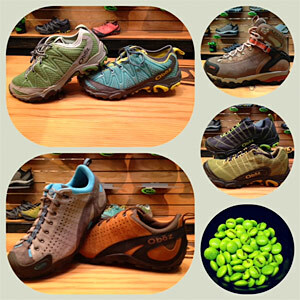 Oboz showed us a bowl full of green Oboz M&Ms (as seen on Instagram)…as well as some great hiking boots and trail shoes. John and Sue spent some time getting to know the fellas at Innova where they all received a survival bracelet and a hug. Of course there were Llamas too and a contest related to it. 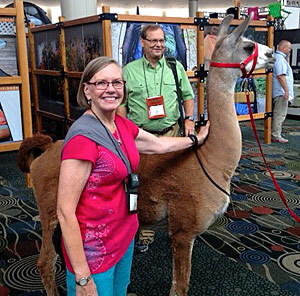 John and Sue are having a pretty good time with this Llama. To win some goodies go to our Facebook page, Like us and find this photo to provide your own caption. Our 3 favorite captions will receive a care package courtesy of fiftysense.com. The contest will go from Aug. 9 @ 7:15 am ET through Saturday August 16th at Noon ET. You have one week to think and comment on the image on Facebook. Oboz and M&Ms are such a good combo and have so much in common. Oh, how does delicious candy relate to great hiking/trail shoes? Easy, tough exterior that looks great and does a fantastic job of protecting what is inside. Plus they both come in so many fun colors and say Oboz on the outside. Case closed. 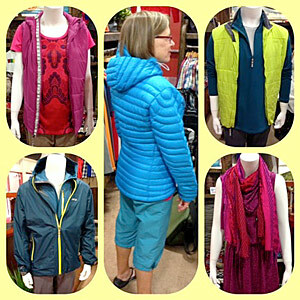 Our co-founder Sue is modeling a new down jacket by Sherpa that has a blend of Down (70%) and Primaloft (30%). This should aide in absorbing less moisture and drying quicker than it’s predecessors. Their new baselayer collection also pairs Primaloft with Merino. One thing that the fellas may like is the new Thame rain shell that stretches. (bottom-left) The articulated arms, back and shoulders all have the ability to stretch just as guys do. These three fine reputable gentleman from Innova Kayaks were the last folks at the OR Show to get survival bracelets and a hug from Sue. They showed all of us just how easy it is to inflate their Swing Single Kayak. We learned thanks to a pressure release valve you are not able to over inflate the floor, not that Sue had them worried as she inflated it. Great kayaks and guys you see here. Have a comment? Send In those emails.